Hello all! Finishing up with finals now, but in this break in writing I wanted to share with you my final paper in my Ancient Philosophy class, which ended up with both a B for this and a B overall. Once again, this essay is the intellectual property of myself(under the name Chelsea Reed) and if you like any of my ideas/arguments, please let me know before you quote anything from it. Please remember, I don’t necessary agree or disagree on a personal ethical level with my view stated here, as this was just an academic paper, and I thought I’d share it with my readers. Again as well, this paper is right at the 1.5k word limit, so it is dense. This paper talks about the five modes of Agrippa and potential answers to Agrippa’s Trilemma, which I encourage you to investigate on your own time, it makes for fascinating mental discourse. Anyway, enjoy! The five modes of Agrippa, given by Sextus in the Outlines of Pyrrhonism and attributed to Agrippa by Diogenes, are used to argue against proofs and specific arguments, and against holding true the idea of having certain knowledge. The modes are as follows- Discrepancy (also sometimes known as dissent or dispute), Relativity, Regress, Hypothesis and Circularity. These modes, divided into material and formal, all end in the suspension of judgment from argument, and can be considered to be part of a general account of skepticism. While simply given as an account by Sextus, and not explored in as great of detail as the Ten Modes, these modes present the problem of the impossibility of knowing truth, particularly with the formal modes, presenting what is known as Agrippa’s Trilemma. This problem holds that we cannot even know truth in such standard fields as mathematics and logic, where one expects to find the foundations of all things that are ‘true,’ and not left to belief. If one considers the given modes, it is quite difficult to state a solution to the problem, but with three general strategies, ranging in ages, one can refute the skeptical argument. While infinitism, coherentism, and foundationalism all provide anti-skeptic refutes, perhaps the most satisfactory answer lies within foundationalism, which by establishing that there exists basic truths, can be used to place a beginning on chains of reason. Discrepancy, or diaphonia, is the first of the modes, and calls for suspension in disagreement, which, at the heart, is used to challenge those who have belief, making it one of the two material modes. This disagreement is so strong that neither the ordinary person nor the philosopher are able to come to an agreement, and so, judgment is suspended (PH I 165). This mode addresses arguments of great controversy, and in fact is reminiscent of the common saying “agree to disagree,” with the idea that instead of continuing to harbor feelings of disagreement, that this is resolved by the altogether suspension of belief. The next given mode is that of regress, eis aperion ekballonta, which is considered the first of the formal modes, and is in essence the formal version of the “why” argument. When a child (or an adult) feels petulant, they often continuously ask why, even though they may ask it about things that are considered established truths. Considering that we, as human beings who think rationally, want to justify our beliefs, we give an argument for them. Yet, one can simply ask, over and over again “Why is that true?” This can refute the argument, and it continues ad infinitum, infinitely, with no reason being a justifiable reason on its own accord (PH I, 166, Aikin “The Regress Argument for Skepticism”). Therefore, a suspension of judgment is required, since there is no starting point. The third mode is the second of the material modes, relatively, or pros ti, holds that beliefs are influenced by the relative influences of the person holding those beliefs, and so therefore cannot be fully examined and must be suspended. A person from a family of high standing, for instance, who supported a view that those of better ‘family breeding’ are more intelligent individuals, would be more inclined to hold this viewpoint than another person of a middle class stature, who holds that intelligence is based not in the realm of genetics but in that of education and academic pursuit. Our relations to the subject of the argument are all different, and so therefore judgment must be suspended (PH I 167). The fourth of the modes is that of hypothesis, which is the mode that was most ascribed to that of the dogmatists. Hypothesis occurs when an individual makes an assumption without providing satisfactory proof or argument for said assumption. A large example of this can, of course, is considered the argument for the existence of deity. When a person, being asked to prove the existence of their deity, simply says that they have faith, they are hypothesizing that god exists and, in having no proof, simply have belief. It is for this reason that many skeptics consider those of religious persuasion to be irrational (and in fact, even those who do believe in deity would consider themselves to be rational only in their attempts to prove the existence of said god, but would still call a person who blindly follows without attempting to formulate argument irrational). It is required by the skeptic then, to suspend judgment on these matters, as one cannot ascertain the truth of said hypothesis without proof (PH I 168). The final mode, that of circularity, or ton diallelon, is for those arguments that employ circular reasoning. When the proof of an argument requires the conclusion of said argument to be true in order to attain a true conclusion, it falls into the trap of circularity, or begging the question. A common form of this happens when an individual tries to prove the existence of god by citing the bible, and then, when asked to prove why that proves the existence of god, relies on the notion that the bible was written by god. Such reasoning never has an end, and does not prove itself, or provide any sort chain of reasoning, and instances of said reasoning are common fallacies even today. With this in mind, one cannot assume the truth of either the premises or the conclusion, and therefore judgment is suspended (PH I 160). The three formal modes are widely considered to block most arguments that would allow for any notion of truth. Three main anti-skeptical strategies have formed, over the centuries, to combat the Trilemma, and be able to support the existence of truth. In brief summary, the three are foundationalism, which holds that there are indeed basic truths at the beginning of reasoning, coherentism, which denies that arguments in which their existence is within the proof itself require suspension of judgment and instead that many well-reasoned arguments do this, and that of infinitism, the most modern of the three movements, which holds that chains of reasoning have no inherent need to have a finite beginning, but can instead be infinite and still satisfy the requirements of rational thought (Aikin). While considering each of these, all have their own merits. The weakest of the three appears to be that of infinitism, if for anything that one can claim that we must have the entire chain of reasoning to be present in order for truth to be obtained, and so infinitism itself just doesn’t function. While both coherentism and foundationalism both face arguments against them, as described in Aikin’s article, coherentism also faces a separate challenge. While it seems completely plausible that certain types of reasoning hang well together (as Aikin describes with the examples on proving the existence of gravity), this is quite close to the fallacy of begging the question, which itself is a subset of circular reasoning. Foundationalism, in its own way of refuting the mode of hypothesis, can be attacked by a skeptic as simply being a hypothesis. However, it is possible that this is not the case. If one takes the idea of existence, while some do argue whether it is true or false in certain systems, a sort of common sense view is that, in order to think, to do tasks, to walk, to be present, one exists. Therefore, it can be considered to be a basic truth. A foundationalist would hold that certain things do not require proof and that the skeptical mode of hypothesis would not apply, as this is not a self-created truth, but something that exists outside of that paradigm. While this can be contentious, it seems to be the most satisfactory current answer to Agrippa’s Trilemma. Skepticism itself is often a useful method for critiquing arguments, and the five modes are no exception to this. When one applies them to many arguments that they come in contact with daily, it is possible to refute many of them using the five modes as a basis for doing so. It is, however, somewhat unsatisfactory to say that there exists no truth, and the ideas in foundationalism seem to provide what can be considered an at least fair rebuttal of the mode of hypothesis, thereby finding a solution to Agrippa’s Trilemma. While this rebuttal itself can be argued, the fact that, in order to critique the foundationalist argument one has to exist, to be able to speak and write out the critique itself, shows a sort of proof to existence, which can be used to support the existence of things as a basic truth, and there the breakdown of the modes begins. Overall, one can still consider the modes as a very useful tool for critiquing the arguments of others, but is not necessarily a satisfactory construct on which to take one’s entire understanding of the notions of truth. Another Ancient Philosophy paper, this time dealing with Aristotle on virtue in the Nicomachean Ethics Once again, this essay is the intellectual property of myself and if you like any of my ideas/arguments, please let me know before you quote anything from it. Please remember, I don’t necessary agree or disagree on a personal ethical level with my view stated here, as this was just an academic paper, and I thought I’d share it with my readers. A fair warning, it’s quite dense and is right at 1.5k words, give or take a few, so it’s not a read for a quick scan or whatnot. I hope you guys enjoy, it wasn’t really titled, so I’m just going to jump right in. Please excuse the few grammar or punctuation mishaps that are in here, sometimes copy pasta from Word will mess things up slightly. I hope you enjoy! Throughout the Nicomachean Ethics, Aristotle explores both the concept of virtue in its relationship to happiness as the supreme good and as its existence as a mean between two extremes. Yet, an interesting conflict happens when one considers the idea of virtue as being both as a mean and as a particular to an individual, and that is the relation of the universal notion of ethics as well as its place within a community. This conflict, however, is not a needed one. The notion of virtue as given in the Nicomachean Ethics, particular to both the individual and as a mean between two extremes, does not destroy the concept of universality or the involvement of the community in ethical examination, as the universality of virtue depends not on the location of the mean, but the pursuit and activation of it through action. To first properly examine Aristotle’s notion of virtue, one must look at it in the context in which it originates in the Nicomachean Ethics. Aristotle begins his famous ethical treatise by exploring the existence of a supreme good, doing so by establishing the following argument: that some actions we perform are for the sake of themselves, that not all actions are performed in this manner as that would lead to desires that are both empty and futile, hence there must exist some sort of best, or supreme good (1094a 18-22). From here, we see that most people agree that happiness exists as the supreme good, this being accepted by both ‘the many and the cultivated’, but that the disagreement comes in the individual conceptions of happiness (1095a18-22). This relates to virtue in the later stated function argument, where happiness is the result of a good life. The argument is as follows—first, if something is good, it performs its individual functions both well and consistently throughout its lifetime. Second, humans themselves have a distinctive function in performing activities that have a function of reason, which is the rational part of the soul. Then, we come to the conclusion that ‘the human good turns out to be the soul’s activity that expresses virtue’, which means that living a virtuous life is necessary for living a good life (1097b 25-17). Next explored are interesting particulars about how virtue is acquired and upheld within daily life. The necessity of externals is an important concept for Aristotle, for he holds that they are important to what is finest, beneficial and pleasant. If the externals are lacking (with examples given of good birth, good children and beauty) then they ‘mar our blessedness’, as one without these traits does not ‘altogether have the character of happiness’ (1099a32-6). Therefore, externals are needed to assist with living a life in accordance with virtue, ultimately translating into happiness and the good life. The acquiring of virtue throughout a life is something that becomes extremely important in the second book of the Nicomachean Ethics. 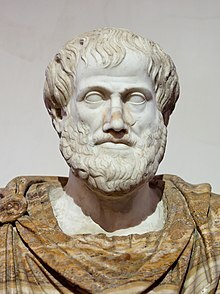 After a quick distinction between virtue of thought (taught, requires experience and time) and virtue of character (a process of habituation), Aristotle establishes that virtues of character are not innately within humans, but that it is completely a result of practice (1103a15-19). This learning through habituation leads to the pleasure principle, in that an individual only has a virtue if he not only performs actions expressing it, but feels pleasure from it. So, to properly establish virtue, one must perform virtuous actions and feel pleasure from that, and then over time one will come to develop that virtue on its own (1104b4-9). The last two primary concepts of virtue to explore in order to get a full view of Aristotle’s notion of virtue are what virtue actually is, and its place as a mean between two extremes. The first of these places virtue as either a feeling, capacity or state, as ‘these are three conditions arising in the soul’ (1105b20-21). Aristotle then argues for virtue as a state of character in the following manner- that, first, virtues are either feelings, capacities or states. Yet, virtues cannot be feelings, since it is based in what our actual actions are. In the same way, virtue cannot be a capacity, since capacities measure what one is capable of, and not their actual actions and performance. Therefore, by default, a virtue must be a state of character (1105b30-14). The last main pinnacle of Aristotle’s definition and notions of virtue lie within triadism and the doctrine of the mean- that virtue itself is a mean between two ends, neither superfluous nor deficient. This doctrine of the mean is supplemented with the doctrine of opposition, or compensation, which follows that we resist the most common vice, and that finding virtue is often overshooting what we believe to be is the mean. Individual examples of this include the mean between cowardice and rashness in bravery, the mean between pleasure and pain in temperance, the mean between stinginess and profligacy in generosity (1107b1-16). It is important to note that the mean between the two is not a set number for every person, nor is inherent within each person to have the exact same amount of virtuous acts to practice in order to cultivate said virtue. Being given this information, one can assess the impact of this, virtue as both a mean and as particular to individuals, upon a community and the idea of universal ethical implications. First, we must consider community. It is not necessarily a given that, in pursuing virtues independently, that community would be impacted at all. If one considers the importance of externals upon individuals, would not the presence of others be most important to tell individuals how close they are to their own mean? If we cannot judge ourselves without the presence of others, cannot fully assess our own happiness, which is living in accords with virtue, which means that we must be actively pursuing the means at which virtue lies, then how can we adequately assess whether we are virtuous without those externals? It cannot be done, following Aristotle’s notions of virtue. In addition, is not community itself assisted by the presence of those who are all actively pursuing virtue and keeping the others informed of their own progress? This individuality helps regulate the community. Also, one must consider how the particular nature where virtue lies impacts the concepts of universality in ethical human behavior. If we consider that most all individuals would be pursing their own efforts towards the individual point within their means of virtue, it seems that even though the points of the location of the means are not universal, the actions of pursing virtue are. As a community morally self regulates, individuals who are not at their mean are informed that they must work harder to reach that. For example, when one person pursues generosity, but perhaps the mean for them is lower than the mean for a richer man, the community would not demand that they give as much to achieve that virtue. If the situation were reversed, so that the poorer man gave more than the richer, then the richer man would be informed that he has not reached that mean, and therefore has not achieved the virtue of being generous. As he gives more and more, he takes pleasure in this, and then slowly that giving becomes the virtue of generosity.